A new study on teardowns in the Chicago suburbs has been making the rounds on urbanist Twitter, and provides an excuse for looking at the phenomenon of zoning-constrained redevelopment outside the city. In Chicago proper, it’s a little hard to do this precisely, because a) common zoning limits vary from single-family homes to two-, three-, and four-flat apartment buildings, and so a given permit for a three-unit building might represent densifying a lot that used to have a single-family home, or it might represent a “teardown” replacement of an older three-unit building; and b) the huge amounts of development downtown mask the very spare development of large multi-unit buildings in the neighborhoods. Anyway, just as the city of Chicago’s zoning encourages developers to tear down older single-family homes, two-flats, and three-flats, and replace them with buildings of equal or lesser density built for wealthier customers – because they’re not legally allowed to build a larger number of potentially cheaper units – I strongly suspect that suburban teardowns are encouraged by zoning regimes that don’t allow for densification of single family home areas. In the absence of the option of building more units, it makes economic sense to just build bigger single family homes. 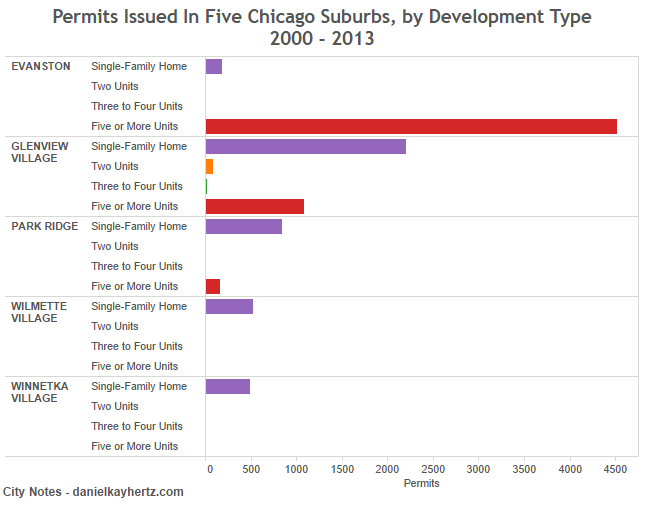 The chart above shows what it says – residential building permits in five suburbs from 2000 to 2013. The bottom four are all identified by the teardown study as being particular hotbeds of teardown activity. Evanston is not, but we’ll come back to what makes it interesting in a moment. One thing that stands out is that Wilmette and Winnetka have literally not allowed a single new apartment building since the turn of the century. But what I think is most relevant here about all five suburbs is that there is virtually no construction whatsoever of small apartment buildings of two to four units. In fact, Glenview is the only town that issued enough permits for those kinds of buildings for them to even be visible in the chart. Fascinatingly, when these suburbs do allow new multi-unit apartment buildings, they are virtually all of the large, five-or-more unit variety – and I strongly suspect, having been to these places, that if we could set the threshold higher – say, ten or twenty or forty units – that we would see that virtually all new multi-unit projects are very, very large indeed. This reflects a peculiar dichotomy in zoning in places like Evanston and Park Ridge: neighborhoods are either zoned for single-family homes, or very large residential buildings. The large building areas in these suburbs tend to be in very high-demand areas that have historically been denser than the rest of the town – downtowns centered on an old commuter train station, say – or some out-of-the-way parcels, often separated from the rest of town by a large road or train tracks, where the town decided they could brook lower-income apartment development. 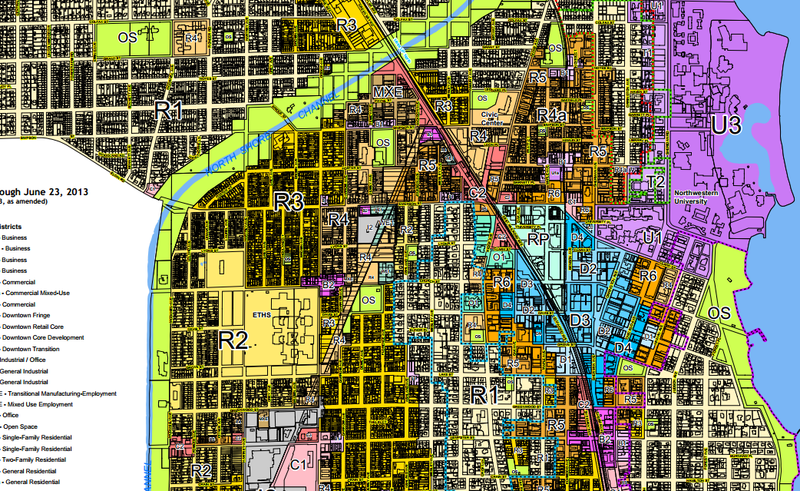 Evanston’s zoning map illustrates the issue: everywhere except for the blue Downtown zones in the center – and the darkest R5 and R6 zones around it – multi-family development is either illegal or requires extremely impractical minimum lot sizes. What that means is that the sort of gradual, small-scale densification that might make sense in a residential neighborhood where rising prices are creating pressure for redevelopment – replacing a single family home with two to four units on the same lot – is ruled out. Instead, developers either have to build big within a very small geographic area, where those areas exist at all, or they have to do a single-family teardown. Interestingly, Evanston – which, relatively speaking, has taken the build-it-big philosophy to heart, allowing more large residential construction, and thus more added density, than any other mature Chicago suburb – is also not identified as a place with a teardown epidemic, despite having real estate prices that are definitely comparable to places that are. Whether that’s because of regulations that prevent teardowns, or a release of development pressure via huge condo and apartment projects, I have no idea. But it is notable. I should also note that this dichotomy isn’t necessarily terrible: especially if dense development is focused around transit stations, it’s a perfectly reasonable way to allow housing supply to grow, and thus help keep prices from skyrocketing, while protecting large single-family-home neighborhoods, if that’s a local priority. That, for example, is something like the Toronto model, where skyscrapers are allowed within a quarter mile or so of outlying subway stations, surrounded by a sea of relatively low-density housing. That said, of course, the scale of density that’s required in those islands for it to balance restrictions elsewhere is pretty massive, and it seems clear that even Evanston isn’t close to reaching those levels. Which means that it’s a shame that smaller-scale densification that might be more palatable to single-family neighborhoods is off the table. There are many examples of neighborhoods throughout the metro area where single-family homes and two- to four-unit apartment buildings coexist quite peacefully; we ought to be creating more of them. NB: I should note that the city of Chicago also has a “valley” of medium-sized development, but it’s in the sort of four- to ten-story midrise building, rather than three-flats. The basic dynamic is the same, though: zoning allows for either very little, or no, increase in density, or a massive increase in density in a very small geographic area. Gradual densification of the sort that has typified urban development for most of our history is off the table. I suspect two dynamics at work against two and three unit buildings. The primary one is that zoning doesn’t allow it. Normally there is a single-family zone that allows only one unit per lot (therefore no duplexes or triplexes) and effectively prohibits subdividing the lot to get more units. The next loooong step up the zoning ladder is multi-family, which is presumably meant for large apartment buildings. The second dynamic is that there is a base cost for beginning construction of any size, so you are going to max out your allowable units when you are lucky enough to have a piece of land zoned for multi-family. If the economics only work out for an incremental increase, from one to three units for example, maybe you pass on the land and keep looking for a site where you can do a 20 unit building. The secret to incremental increases in density is softening the existing single family zones: allow basement and backyard accessory units by-right; allow duplexes on corner lots where each entrance faces a different street; allow existing big houses to be converted to duplexes where there is no change to existing footprint. It’s something, at least. And, yes, it’s astonishing to see hypocrisy of suburban residents crying out against tear-downs and mansionization. It’s their exclusionary zoning (monoculture single family) that drives the trend. If you are constrained to only replace one for one, why not build it huge and chase after the luxury buyer? While maybe not a major driver, it’s worth noting that Evanston is the only one of these communities that hosts a University (8,000 full time undergrads in a town of 75,000; ~10%). Yeah. I mean, Evanston makes sense as a major secondary activity node: great access to the city on the L and Metra, a major research university, already a retail destination with some office, etc. And to be fair, they’ve embraced that to some extent over the last several years, both downtown and along the Chicago Ave. corridor. But they could be doing much more. Also, within Chicago, aren’t high-rises far more common near the lake, for the views? Which explains some of the difference vs Park Ridge & Glenview, but underscores the “Mansion” bias of Wilmette and Winnetka. Being near the lake has something to do with it, but zoning also has something to do with it. There are small highrises dotted all over Chicago’s inland neighborhoods, and where locals will accept them, they’re still being built. Canadian cities with lots of new infill, such as Toronto and in particular Vancouver have an even more extreme valley: it’s mainly high rises with some big low rises or detached homes (Toronto has some older attached / semi-attached but not a huge amount). Both have a higher high rise % than NYC. Partially zoning, but it’s also economics, the technology and market has changed (families avoid apartment buildings more, childless couples don’t mind big apartment buildings as much). NYC doesn’t have a high rise peak: 4-6 story apartment buildings “Chicago’s valley” is NYC peak housing type. The relative lack of 4-6 story apartment blocks surrounding downtown is one of the obvious Chicago – NYC differences. Chicago’s River North resembles Vancouver high rise areas surrounding downtown though more older building stock rather than anywhere in Manhattan. I’d imagine the market for houses is more or less separate – and yeah, it would get expensive, but I don’t know what the alternative is. The number of single family homes is pretty severely limited by land constraints, obviously. That is a lovely site though – have you seen the “New York Apartments That Are More Expensive Than European Castles” tumblr? This article is also relevant http://www.urbanophile.com/2014/10/14/teardowns-are-transforming-the-american-post-war-suburban-landscape-by-suzanne-lanyi-charles Notice how the teardowns are clustered in the North Suburbs (and and also in the South Suburbs). Also, notice how the teardowns are being replaced by much larger houses. Developers have told me that apartment projects just aren’t worth their time and effort unless they can get a lot of units in one place. If Chicago or any other city really wanted these duplexes, triplexes, fourplexes, I believe they’d need to simplify the process to the point where you could take on building them even if you weren’t a professional developer.